The bartlett mitchell chef of the year has quickly become a highlight in the chef calendar, a chance to test yourself, shine amongst your peers and then there’s the small matter of the prizes! This year included a week’s stage in a Michelin starred restaurant, fully loaded dinner for two at my restaurant Trinity, knives, books and jackets and that’s without the kudos that goes with it. We landed mid-afternoon and checked into a lovely city hotel, the weather was kind and a stroll was in order. First impressions (and lasting actually) is that Copenhagen is full of happy people in a spacious clean city that felt safe, bright and memorable. Onto the business of a light lunch, we kept things simple and local and all tried delicious herrings, mussels in white wine and prawns all washed down with some local beer, a great way to start! A short walk back for a turnaround to dinner at the world renowned Relae Restaurant. This was what we were all looking forward to. Relae has a cracking wine bar opposite called Manfreds, perfect for an aperitif. Dinner at Relea was excellent, 8 courses, Nordic inspired, technique driven and perfectly executed food in a very relaxed surrounding with warm and knowledgeable service and great wine. The highlight for us all was seared squid and celeriac parfait, I still can’t quite fathom its textual brilliance. A tour of the kitchen and a good night’s sleep followed. The next day we walked 14k steps (according to my phone) it was worth it and we needed it…. A trip to the brilliant Hart bakery from former Tartine’s head baker Richard Hart, with its exquisite pastries and immaculate coffee, was the best start you could ask for. Off to see 108, an iconic Copenhagen landmark restaurant for more coffee and a quick chat with its superstar owner Rene Redzepi. Lunch followed in the form of restaurant Geist. Relocated to the centre of town the food at Geist is the most instagramable food anywhere, but does it deliver on flavour? The service was a little jaded but made up in droves with a visit from Bo Bech himself with a personalised book for our William! The food is intelligent, personal to Bech and individual, not everything set us on fire, but the moments of magic made it worth the trip. 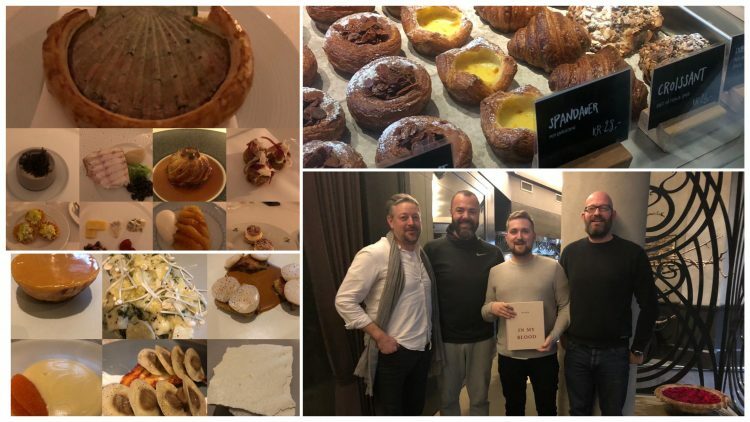 We had a reservation for dinner at Kong Hans Kaelder – a restaurant I recommended as a contrast to the Nordic fare we had experienced, Kong serves classic fare, old school service and tip top ingredients. It didn’t disappoint, in fact this was probably in my top five all time great meals. A remarkable restaurant. Intimate and warm with food and service at the very top of its game. The dessert trolley alone is worth the plane journey! We started with immaculate canapés, scallops baked in shells, followed onto turbot and caviar (as you do.) pigeon with truffles and a venison pithivier. We drank appropriately well, introducing William to the joy that is Gevry Chambertin. We wanted Will to experience the very best that food and wine can offer, and this really was it. Once again, after a good night’s sleep, we made perfect time for the plane and were all back in London within a few hours. We agreed that these restaurants are ones you would hope to dine in once a year. A whirlwind trip like this is a rare and incredible way to immerse yourself into a foreign food scene. Copenhagen is a remarkable city; its food is entrenched in its culture. I for one can’t wait to go back and hope that Will’s experience will stay with him for many years to come.